John Hoppenthaler’s books of poetry are Lives of Water (2003) and Anticipate the Coming Reservoir (2008), both with Carnegie Mellon University Press. CMUP will publish his third collection, Domestic Garden, in late 2014. With Kazim Ali, he has co-edited a volume of essays on the poetry of Jean Valentine, This-World Company (U of Michigan P, 2012). 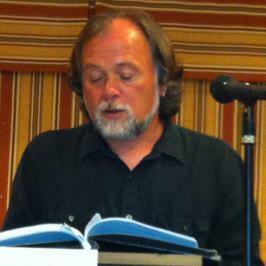 His poetry appears or is forthcoming in Ploughshares, Virginia Quarterly Review, Southern Review, McSweeney’s Internet Tendency, West Branch, Christian Science Monitor, The Literary Review, Subtropics, Blackbird, and Copper Nickel, as well as in many other journals, anthologies, and textbooks. For the cultural journal Connotation Press: An Online Artifact he edits “A Poetry Congeries” and curates the Guest Poetry Editor Feature. For nine years, he served as Personal Assistant to Nobel Prize-winning author Toni Morrison, and he is currently an Associate Professor of Creative Writing at East Carolina University.